A first-half blitz from the hosts put them in an excellent position and despite a strong fight-back from the Blues, they just couldn’t make up the deficit. Things didn’t get off to the best start for the Blues when they couldn’t take advantage of a line-out deep in the Coventry 22 following a good kick to touch from Rich Lane. 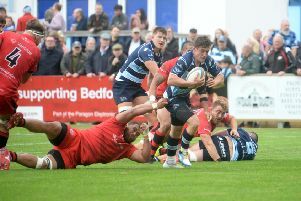 Coventry made the Blues pay as Jake Sharp slotted a seventh-minute penalty, but Bedford fired back with a well-worked try when Jamie Elliott made a powerful break through the home side’s defence, Ed Coulson adding the extras. The hosts didn’t let their heads drop and three tries in eight minutes helped them to take full control of the opening 40 minutes. A mix-up in the Blues’ defence allowed Andy Bulumakau to glide in under the posts in the 19th minute before Tom Kessell rounded off a fine move five minutes later. In the 27th minute, a pick-up from the ruck by Jack Lam on halfway led to a fine break with ex-Blue Tony Fenner dotting down, Sharp converted, just like the previous two, to make it 24-7. It got worse for the Blues when Kessell added his second try, and secured the hosts’ bonus point, in the 34th minute, but Sharp’s conversion went begging. Bedford ended the period in better fashion when a pinpoint crossfield kick from Coulson found Ryan Hutler in space and the youngster crossed the whitewash to score, Coulson slotting the extras. Coulson added a penalty on the stroke of half-time to make it 29-17 at the break. With an uphill challenge facing them in the second period, Bedford knew they needed to start strongly but failed to do so as the hosts crossed for their fifth try when flanker Adam Peters crossed in the corner for an unconverted score. Trailing by 17, the Blues sparked into life with a huge amount of pressure on the Coventry try-line which resulted in a penalty. A scrum was set before the ball floated out to Hutler, who crossed for his second try of the game to make it 34-22. The tide seemed to be turning and Bedford got a bonus point of their own with 13 minutes remaining when another superb crossfield kick found debutant Harry Davies, who scored in the corner to reduce the deficit to seven points. With time ticking away, Coventry’s James Voss was sent to the sin bin following huge pressure in the home side’s 22. However, Coventry held out to pick up the victory and inflict the first defeat of the season on the Blues. Bedford are on the road again this weekend when they visit the Madejski Stadium on Sunday to face London Irish in the Championship.